It may only be the start of 2015, but it seems that we've already seen to the IT party of the year, no wait, the Party of the Century. Held to launch Empire Group's new development, the Party of the Century at Empire Entertainment City, Damansara Perdana was a grand multi-million dollar affair attended by over 3,000 people with the entertainment of the night provided by Paris Hilton, Taboo from the Black Eyed Peas, Mark Vincent the winner of Australia's Got Talent, and South Korean group, 2AM. Among the local celebrities that were present for the night were, Ning Baizura, Jaclyn Victor, Joey G, Sarah Lian, Will Quah and more. South Korean group, 2AM kicked off the party. 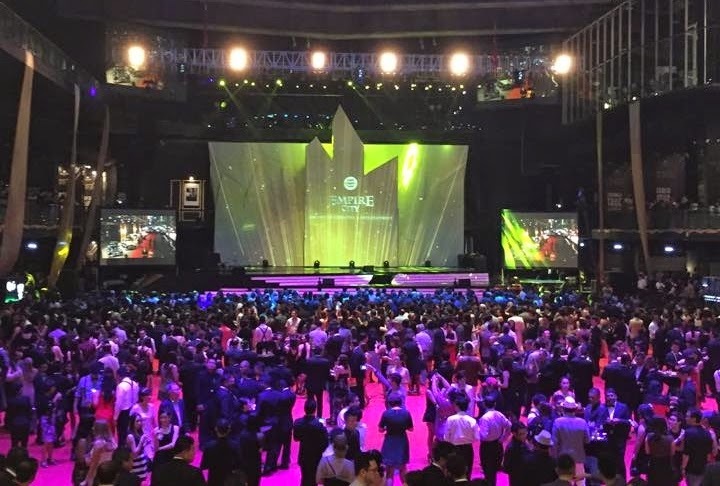 Despite braving the Friday night traffic and the horrid jammed roads leading to the venue, invitees made up of mall tenants, VIP guests and celebrities were pacified upon entering the venue after walking on the red carpet at the grand enterance for the main party area; the skating rink of the upcoming shopping mall grounds which was covered with red carpet and dim lighting for a 1920s setting. A talented violinist played while suspended in air from the ceiling. Invited guests in their best flapper wear got to fill their tummies with finger food catered by the Berjaya College of Culinary Arts school and quench their thirst with free flow of drinks from Carlsberg, Kronenbourg, Martell and more, before South Korean group 2AM took to the stage for a 30-minute performance. The winner of Australia's Got Talent, Mark Vincent then came on stage to deliver an uplifting rendition of Josh Groban's "You Raise Me Up". By 10pm, the main act and the main talking point of the entire party; Paris Hilton finally took to the stage for her DJ set. Guests who stood close enough to the stage noticed that Hilton's set had a shaky start as she constantly had to turn to her back or duck under the console to yell out for her dancers, who were presumably to come on stage for her first song of the night "Stars Are Blind", but only did so during the middle of the second song after some technical glitch. Paris Hilton takes the stage with her DJ set. Taboo from Black Eyed Peas. After Hilton's 30-minute set for which she stayed behind the console all night playing songs like Coldplay's "Sky Full of Stars" and Taylor Swift's "Shake of Off", guests were treated to a more upbeat show from Taboo from the Black Eyed Peas, who not only played hits from the DJ console, but also came in front of the stage to dance and sing a few lines while, coming down the stage to move about and mingle with the guests standing below. Other acts for the night was an eclectic show by speed painters and an aerial acrobatic show comprising of a talented violinist that played suspended from the ceiling. Empire Entertainment City is expected to be operational by mid-2015 and will boost facilities such as a shopping mall, skating rink, bowling alley, residential developments, a hotel and South Korea's first cinema in the country, CGV Cinemas Empire City.